Upon returning home from our recent wedding in Italy, our guests, like us, probably felt the bump of landing in several places – the legs and spine (from airplane travel) and the wallet (from the careless assumption that a euro is only worth a little more than a dollar). We also felt that bump in our gut – no, not the one gained from vacation over-consumption, though we now jiggle unintentionally in several new areas – but the corporeal shock brought on by the sudden lack of carbohydrate-heavy foodstuffs delivered at least twice daily and washed down with liters of wine. Our livers are probably grateful that the recent, heady days of a personal pizza for lunch, and a pasta primi and meat secondi with potato contorni in the evening are over, but we find ourselves missing those regular hits of starch, and the challenge of trying to figure out just what kind of pasta we were ordering. Many linguistic officianados may mock those of us who struggle with even the most basic of restaurant Italian but we’re sure that our wedding guests, as we did, learned a great deal more Italian than they knew before just from negotiating two menus a day for a week. Unfortunately, however useful it is knowing that senza gas and naturale refer to still mineral water, it pales into insignificance compared to the sophisticated and nuanced ability to identify the shape of the pasta on offer. Do not feel downcast though, if you were surprised when your food came, as we learn from Heat – Bill Buford’s humorous account of a novice cook’s experiences in several famous Italian restaurants – so creative and impish are Italian pasta-makers in playing with the form of their dough that many natives do not always know exactly what it is they’re getting. Over the course of a three week trip, we had exactly zero disappointing meals, even when forced to eat at highway service stations (AutoGrill), and in spite of frequently ordering things completely blindly due to inadequacies of our dictionary. That said, it would have been nice in some cases to have had a better idea of what to expect so our levels of anticipation could have been higher, and it is with this in mind that we very humbly (since this would have been a lot more useful to our guests a month ago) offer the following links to a website that removes some of the mystery from Italian menus. In spite of (or perhaps because of) eating pasta everyday for the best part of a month, we’re reluctant to give it up, and are studiously trying to recreate some of our favorite dishes from our trip at home. Just last night we made an uber-simple but very delicious gemelli with arugula, cherry tomatoes and canned tuna dish we had at a tiny, hole-in-the-wall place in the mountains of Elba. 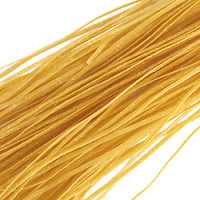 If you’ve been carbo-loading in Italy recently and aren’t ready to give up your pasta fix either, we’d love you to send us recipes for versions of your favorite Italian dishes. They don’t have to be exactly the way they were made when you had them in Italy – that’s probably impossible – your nearest and most delicious approximations will do just fine. Add a comment to this post. P.S. 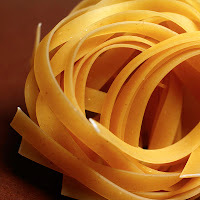 – our hearty salutations to anyone who’s figured out which of the pictures in this post is tagliatelle and which is tagliolini.